You rarely associate the word “easy” with film editing. Because the process of enhancing raw footage is time consuming, often complicated and definitely tedious. There are over-priced solution on one end of the spectrum which cost an arm and a leg and take months to master. 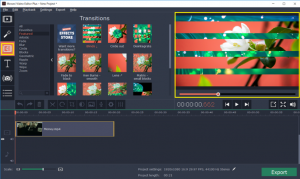 On the other end of the spectrum are rudimentary tools that allow you to cut or split films and join parts of files together for shaky, unprofessional home videos. It is quite difficult to find an option that fits the budget yet makes it worth the editor’s while to actually buy it. 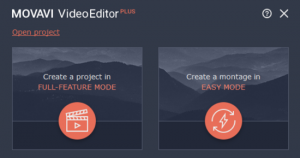 In this regard one of the best film editing software that’s easy to use is the Movavi Video Editor. Movavi has an interface that can be mastered in 10 minutes flat. Why do we know? Because we timed ourselves. Total amateurs can figure out the icons and the tools and get editing! Movavi is made for laptops. It doesn’t hog processing power and resources. In each and every functionality, the primary consideration has been achieving a stellar end result without busting the laptop. 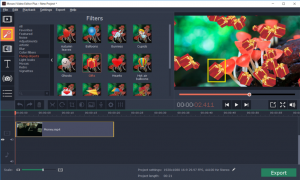 Movavi is built for the socially connected video editor. You can create clips that are directly uploaded to YouTube. You can tinker around with footage and enhance it for direct to television 4K viewing. And a lot more. 1. Click the Movavi icon on the home screen to launch the application. The window that greets you limits options to two – either create a movie with all the bells and whistles in Full Feature Mode or assemble a montage in the Easy Mode. 2. The actual workspace that opens up is clean and streamlined. There is an obvious Preview Window to the right. The icons that matter are vertically stacked to the left – because people read from left to right and that’s our default eye movement. To make matters simpler, the first icon is pre-selected. 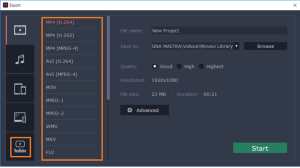 It is the one that allows you to “Import” files from your hard disk or use the stock resources in the Movavi library. Click on “Add Media Files” to access footage files in your permanent memory. Use the “Record Video” button to activate your laptop’s built in camera and shoot on the go. Use “Record Screencast” to capture workflows on your device screen. With Sounds, Music, Sample Video and Backgrounds, you can instantly spice up your films with stock audio and visuals that come with the Movavi application. 3. The files and content you choose to work with show up on the editing timeline. This is pretty standard. There is a special Movavi touch here though. You can use the following slider to actually adjust the relative size of the movie clips on the timeline. This lets you get an overview of multiple files in a sequence. Split the clips into multiple parts. This can be done with the scissor icon. Adjust the colour saturation of scenes in a clip. This can be done with the icon that resembles a colour wheel. Crop scenes from clips and change the orientation of the clips. This is a simple action that adds instant pizzazz to your home films. Record a voice over. Because sometimes catching audio in clips shot on the go can be difficult. The microphone icon is the one that has to be used here. 4. Now let’s explore how you can enhance films with filters and transitions. Simply click the icons that resemble a magic wand and jigsaw puzzle pieces to reveal 12 categories each of filters and transition effects running the gamut from flying objects to subtle vignettes and dramatic warps. Ease is again the primary consideration here. You can simply drag and drop an effect over a clip to apply it and see the end result in the Preview Window. Don’t like it? Right click on the “star” that shows up on clips with special effects, choose the filter or transition you wish to remove and click “Remove”. 5. Finally save your home film by clicking the green “Export” button. 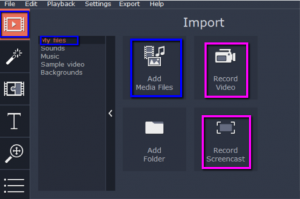 Doing so allows you to automatically convert your file to one of dozens of common and not so common video formats for televisions, PlayStation, iPhones and more. Does editing get faster and easier than this?